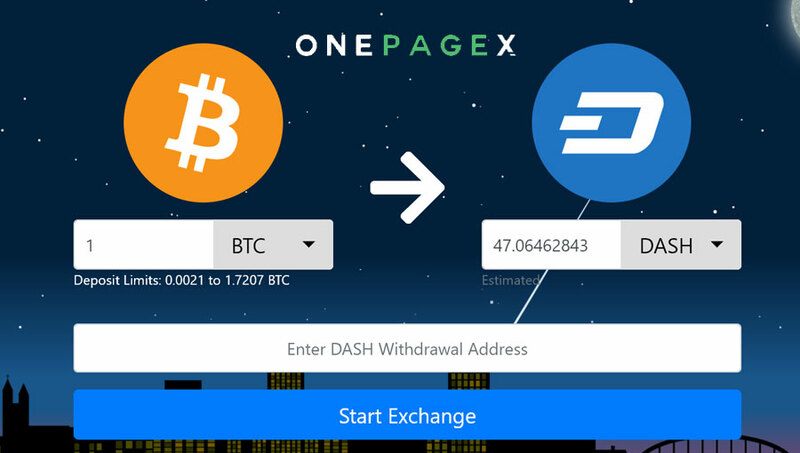 The Dash team has announced that its native DASH asset is now fully integrated into OnePageX, a unique DEX platform that offers users the ability to exchange a wide variety of cryptocurrencies and blockchain assets using an extremely simple one-page interface. As the name implies (contracted from OnePageExchange), users can carry out all their exchange activities on the neat and simple homepage. Unlike many decentralized exchanges, OnePageX places a premium on ease of use, giving users the ability to focus on exchanging their assets instead of learning how to work the platform interface. As a fully decentralized exchange, OnePageX also does not require data like passwords, emails or KYC information. All users need to do is visit onepagex.com, choose their desired cryptoassets, fill in the required fields, and immediately start exchanging more than 140 available cryptoassets at the best possible prices. The platform makes use of a unique URL generated alongside every single transaction, which enables users to go back and review their activities if need be. The addition of DASH to OnePageX is the cryptocurrency’s latest push, as it looks to expand its global adoption footprint following a period of sustained success across South America and particularly Venezuela.